Grandma's relied on her laundry hints to get her clothes clean. She didn't have our modern conveniences like automatic washing machines, dryers, and reliable dry cleaning. She just had her washtub and washboard. 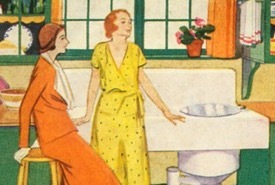 But, thanks to her washday secrets, her wash was always clean and stain free. Now, you can try the same methods on your stubborn laundry problems. Saturate well in tomato juice; it is also an excellent thing to remove stains from the hands. As soon as claret is spilt, cover spot with salt. Let stand a few minutes, then rinse in cold water. Try rubbing them with the yolk of egg before washing. Pour boiling water over stained surface, having it fall from a distance of three feet. This is a much better way than dipping stain in and out of hot water; or wring articles out of cold water and hang out-of-doors on a frosty night. Never put away clean clothes without examining every piece to see whether they are in any way out of order. Much time is saved later. This is one of the most practical laundry hints if heeded. The frayed portions around the tear should be carefully smoothed, and a piece of the material, moistened with very thin mucilage, placed under the hole. A heavy weight should be put upon it until it is dry, when it is only possible to discover the mended place by careful observation. When sheets are beginning to wear in the middle, sew the selvage sides together and rip open the old seam, or tear in two and hem the sides. Articles of clothing, or of any other character, which have become impregnated with bad-smelling substances, will be freed from them by burying for a day or two in the ground. Wrap up lightly before burying. 1. A simple way to remove grass stains is to spread butter on them, and lay the article in hot sunshine. 2. Wet with lemon juice, sprinkle with salt, and spread in sun. You might also try using soap and cold water. Mud stains on silk can generally be removed by rubbing with a piece of flannel. 1. Ink stain can be removed by dipping stain in hot tallow, then wash out tallow, and ink will be removed. 2. Wet with spirits of turpentine; after three hours, rub well. 3. Ink stains may be removed by covering spots with borax and saturating with peroxide. Place a little water in a teakettle, and let it boil until there is plenty of steam from the spout; then, holding the crepe in both hands, pass it to and fro several times through the steam, and it will be clean and look nearly equal to new. Add 1/4 to 1/2 cup of salt to the detergent when washing. This is one of the most popular laundry hints that people look for. If applied immediately, powdered starch will take fruit stains out of table linen. Left on the spot for a few hours, it absorbs every trace of the stain. Lemon juice and salt will remove ordinary iron rust. For mildew stains or iron rust, mix together soft soap, laundry starch, half as much salt, and the juice of a lemon. Apply to the spots and spread the garment on the grass. Rub the mildew spot with yellow soap, wash, and while wet rub powdered chalk into it and cover with chalk. Lay article on grass in sun, sprinkle with clear water. Repeat if necessary. Old mildew stains may be removed by rubbing yellow soap on both sides and afterwards laying on, very thick, starch which has been dampened. Rub in well and expose to light and air. Candle grease yields to a warm iron. Place a piece of blotting paper or other absorbing paper under the absorbing fabric; put a piece of the paper also on the spot, apply the warm iron to the paper and as soon as a spot of grease appears, move the paper and press again until the spot disappears. 1. Mix four tablespoons of alcohol with one tablespoonful of salt; shake together until the salt is dissolved and apply with a sponge. 2. Cut a very ripe tomato and rub material over a kitchen table. Tomato juice will also remove stains from and whiten the hands. 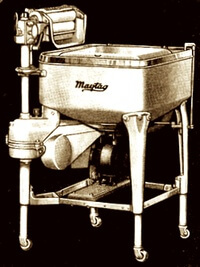 Lard will remove wagon grease. Rub the spot with the lard as if washing it, and when it is well out, wash in the ordinary way with soap and water until thoroughly cleansed. 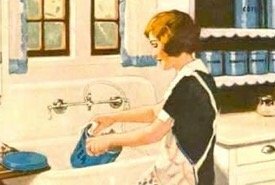 Prepare the water for washing by putting into every ten gallons a large handful of powdered borax; or boil with the clothes one teaspoonful of spirits of turpentine. Saturate the spot and rub it well with turpentine, and every trace of tar will be removed. Beeswax and salt will make your irons as smooth and clean as glass. Tie a lump of wax in a rag and keep it for that purpose. When the iron is hot, rub it first with the wax rag, then scour with a paper or cloth sprinkled with salt. Kerosene will soften leather boots and shoes which have been hopelessly hardened by water and render them as pliable as new. Use cold water, then soap and cold water. Use borax and cold water. Use boiling water; if with cream, use cold water, then boiling water. Use soap and warm water; bleach in the sun. Try using turpentine or kerosene. Soak all clothes overnight in cold water, drain off in morning. All stains will wash out easier. Separate white and colored clothes, of course. Linens should last a lifetime if they are given the proper care. They should be laundered with great care, ironed on the right side and then on the wrong. If white linen is put away for a time, it should be rolled in blue paper, which prevents it from becoming yellow. Wash first in warm soapsuds and rinse them in warm water, having the water neither too hot nor too cold. Soak in sour milk overnight, then wash and dry. Clothes and other items should be aired outside on dry, breezy days until the odor of moth balls disappears. Bring inside when rain threatens and at night. You can also try adding one cup of white vinegar to the wash water when washing your clothes. Use the old fashioned laundry hints with "caution and common sense," and always "at your own risk." There is no guarantee these tips will work on today's synthetic materials and some methods might ruin them. Grandma loved her laundry hints. 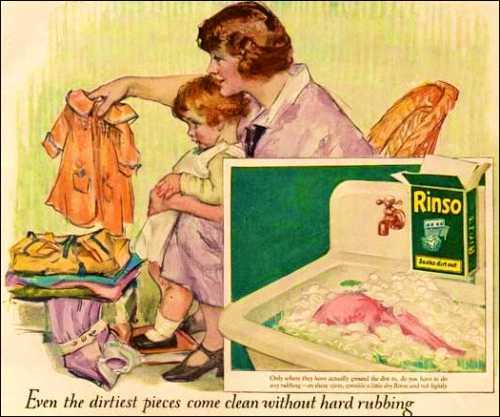 Ink from quill pens, soot from the fireplace, grease from buggy axles, and mildew from a damp house were the biggest threats to clean clothes in her day. Laundry hints for removing rust stains also came in handy, and with nine lively kids there were always grass stains to deal with. And those stains simply had to come out. New clothes didn't grow on trees! But, Grandma always got those stubborn stains out and the torn clothes mended. And now you can try the same methods she used on your hard to remove stains. Enjoy reading and experimenting with these 19th-century laundry hints. 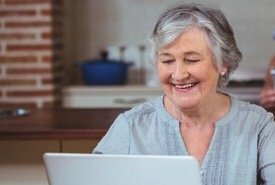 You may find an idea or two that will help you solve your stubborn cleaning problem.